After the cold war came to an end VUCA was invented by the American army. During the cold war the world was quite predictable, but when this came to an end in 1989 the geopolitical situation became VUCA (Volatile, Uncertaun, Complex and Ambiguous). Volatility: The rate of change has increased dramaticaly in the digital era. Where an average product life cycle was 15 to 20 years in the pre-digital era, today an average product life cycle is merely 1 to 5 years. Companies need to adapt to this rate of change. Uncertainty: Companies today face unclear situations in the present and future. You don’t always have al the information, but need to make a decision. To survive in this digital world companies need to deal with uncertainty. 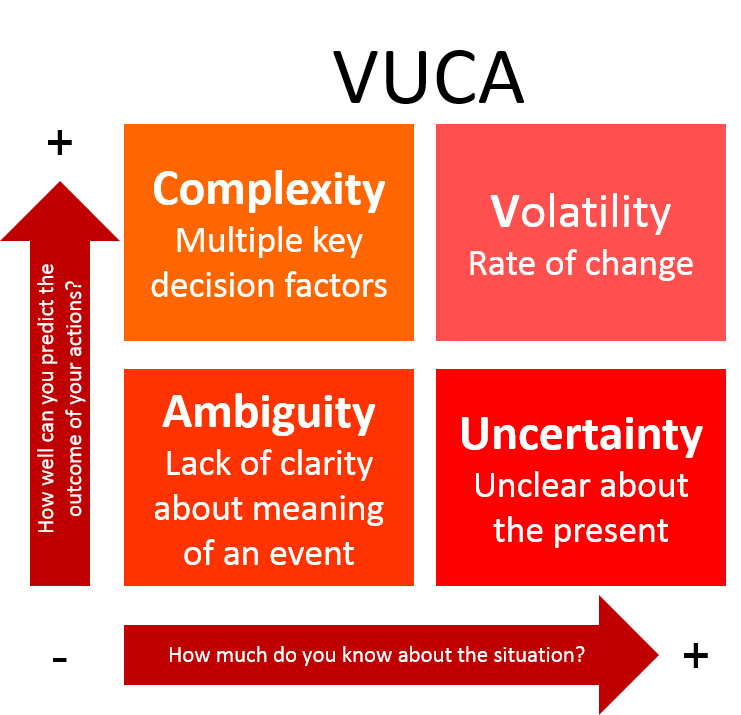 Complexity: With the vast amount of available informatiion it has become (almost) impossibe to be on top of all factors which influence your decision making. There are just to many key factors for decision making. Ambiguity: Most of the time it’s not so clear what your world with its competitors, customers, … realy looks like. Ideas change every minute, so your digital business needs to deal with this not-so-clear situation. Today a company needs to disrupts it’s business (model) or it will be disrupted (in the near future). ICT/Digital infrastructure have an impact on your complete business structure. A business is structured differently in a digital world then in the analogue world. The market is potentialy global in a digital world, but doesn’t need to be. This is a huge pitfall for most internet companies. The illusion that they will service a global market. Digital companies opened the door to 24/7 business opportunities, buying, selling and servicing. A business needs to be organised to need this 24/7 demand of its customer. 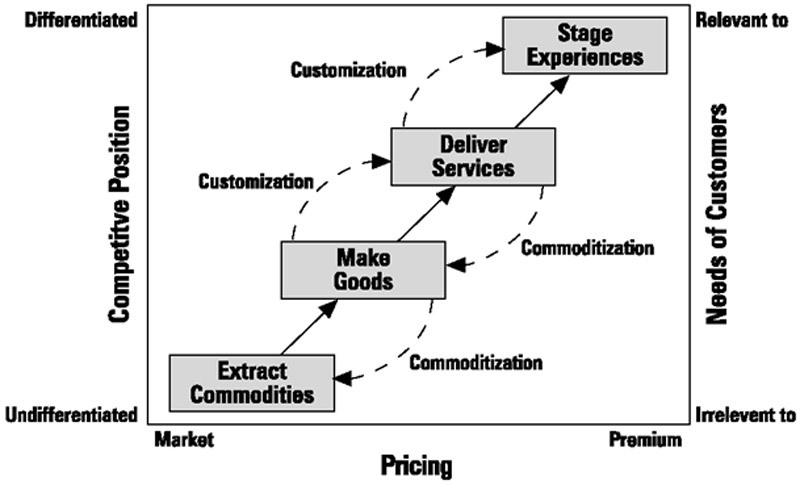 Due to this 24/7 trading model, businesses need to adapt their supply chain to this new situation. The supply chain becomes interconnected. This way warehouses communicate directly with the end-user to make sure that the 24/7 trading model can take place. E-business exists when ICT and digital support all business activities. E-commerce only focusses on the proces of selling products and services via digital. GAFA nomics dominate our customer journey. GAFE will shape our future. Today everybody can be a creator, and disturb the traditional economy thanks to the low entry barriers. Getting an app out in the app-store is only a push of the button away. We see young people disturbing traditional companies with online and digital products and services. The rate of innovation is in a true accelerating mode. Each day new products and services enter the marketplace to service needs. To service today’s customer expectations then you need to understand it’s expectations. More then ever before in a highly competitive world the product (or service) you market needs to service the need(s) even more. Uber raised the bar regarding expectations towards taxi waiting times (f.i.). It is not only the product or service that counts, it’s the complete customer experience that counts. It’ how you differentiate and become relevant to your customer that makes the experience. The less you differentiate and the more irrelevant your product (service) is, the more it becomes a commodity. Small groups of people use technology to make things better, and technology enables these people to make things better. In the new economy people have the power, and this is different then before. People are not only the ‘new’ customer but they can also be also supplier. GAFA is customer obsessed. Traditional marketing is not enough since products and services are considered replacable. Key is to be become indispensable to as many people as possible.